This Volcano Bolt Lock is considered to be one of the best bolt lock on the marine market today. Designed and built to resist criminal tube jemmying. Its smart cone shape design makes it tricky for offenders to strike hard and incredibly difficult to grip with a huge wrench. It’s high grade stainless 316, UK made and, most importantly, insurance approved! Designed for the following engines: Evinrude: 40-250hp. Honda: 40-225hp. Mariner, Mercury: 25-275hp. Suzuki, Johnson: 25-300hp. Tohatsu, Nissan: 40-115hp. Yamaha, Selva: 25-225hp. 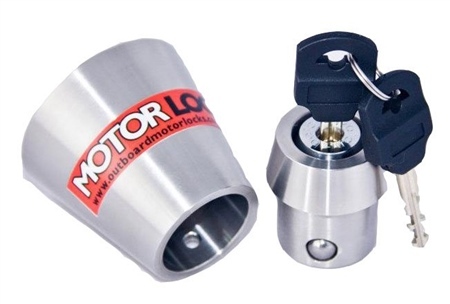 Read here about the initial popularity of the Volcano Lock. Great bit of kit easy to install solid hardware, just one look would put any thief off.